7 Some scholars assert that this occurred in Ramses's 33rd year, which would bring the dates, discussed in the material below, back to Nov. 4, Nov. 1, and Oct. 29, respectively. reluctant to go much beyond this and give reasons for doubting earlier attempts to do so. However, with zodiacal signs and decans clearly associated with asterisms, often with the star diagrams shown, a number of scholars have attempted to do so. There is still value in LePage Renouf's study (1874) of the Ramesside star clocks (criticized and extensively quoted by Clagett 1995, pp. 59-65, 413-414). Renouf argued that the 6th hour of the night had to correspond with midnight, that "in the middle" indicated culmination and that the culmination of Sirius at Thebes in the first 15 days of the month Choiak provided a rough date of about 1450 b.c. Neugebauer and Parker estimated the date as 1470 b.c. and calculated their tables for 1500 b.c. Having the dates of culmination of the other named stars, it is certainly possible to get a good idea of their approximate location in the sky and hence probable identity. The three stars attached to the bull of the Senmut ceiling correspond to the position[s] of Delta, Epsilon, and Zeta Ursae Majoris. Around 3000 b.c., Zeta was the only 2nd magnitude star within ten degrees of the pole; the upper culmination of Eta Ursae Majoris coincided, for the latitude of Thebes, with the setting of Sirius. 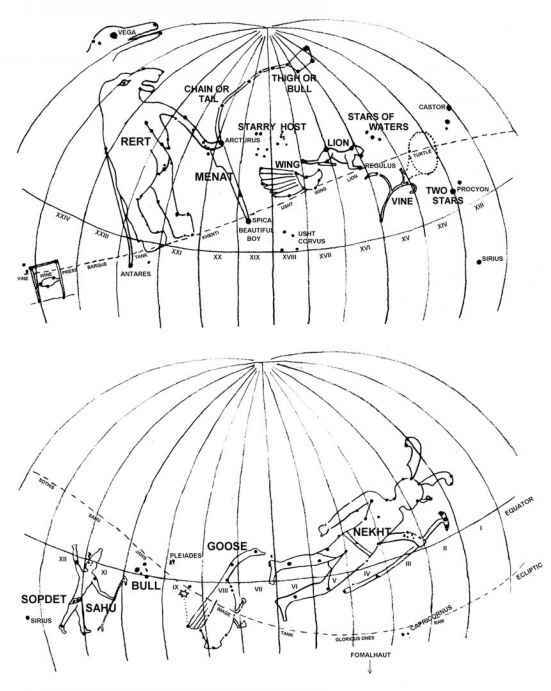 Observations of [the] culminations of circumpolar stars for the determination of the meridian were certainly made by Egyptians when Eta and then Zeta Ursae Majoris were the nearest of the bright circumpolar stars. . .. The star surrounded by a circle on the Senmut ceiling corresponds, obviously, to the early recognizable bright star, Zeta Ursae Majoris—the one with the conspicuous companion. The scorpion goddess Selqet (Serqet) stands behind the bull Meshketi in such a way that it seems as if she were trying to grasp the two cords stretched from the culminating star Zeta—over the invisible pole—down to the northern horizon. Pogo is thus suggesting that the sky represented in the northern half of Senmut's ceiling is much older than the time of Senmut. The month divisions in such a context may suggest a reference to the time when "Inundation" began with the heliacal rising of Sirius at a date that was then near the summer solstice; in short, that the star chart refers to the beginning of the system of 360 days plus five when the name "Inundation" was actually appropriate. Figure 8.4. Petrie's (1940) star map of Egyptian constellations. After Petrie (1940, cited in Clagett 1995, Figs. III-84a and b). Drawing by Sharon Hanna. Venus appeared in that order clustered within seven degrees of celestial longitude just after the rising of the Two Turtles (identified by Gleadow as 8 and g Cancri). The date was the heliacal rising of Sirius and corresponded to 1 Thoth of the civil calendar period. Gleadow thought that the date occurred during the reign of Djoser of the III Dynasty, but the early chronology is very confused. This interpretation implies that Mercury was added later. Neugebauer and Parker (1969, III, p. 3) comment that the decan list of the Senmut ceiling is derived from their "Coffin Group V" (which they date to about 1870-1820 b.c.) and refer to linguistic evidence of Old Egyptian (XII Dynasty or earlier) in the Senmut text. 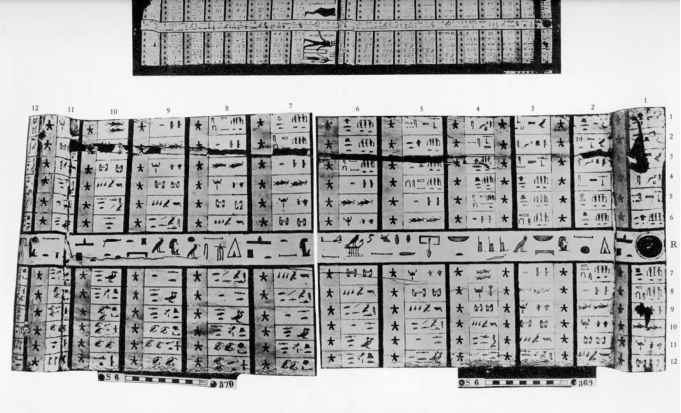 One of the few scholars to have attempted a star map of many of the Egyptian constellations was Petrie (1940, cited in Clagett 1995, figs III-84a and b). See Figure 8.4. He attempted to integrate material from the decan lists, the Ramesside star clocks, and the various star maps, including the ones that incorporate the signs of the zodiac, much more comprehensively than anyone else has done. This version deserves careful attention, although Neugebauer and Parker did not think it worth mentioning. A study by Biegel (1921) is mentioned by Neugebauer and Parker as too naive to warrant discussion, but Clagett (1995, pp. 160-161) summarizes her work and criticisms by Pogo. 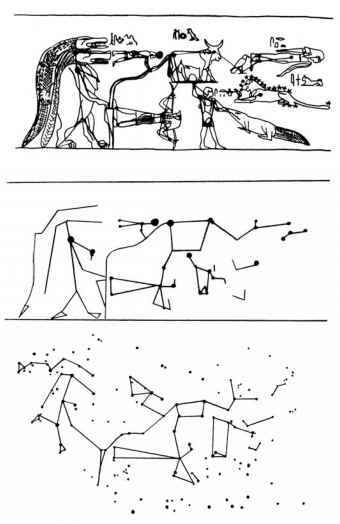 Because some of the star maps contain dots, apparently representing stars, within the figures, Biegel tried to use these to make stick figure representations of the constellations, which she then attempted to identify in the sky. DHK thinks that this sort of naivete may be closer to an Egyptian view of the heavens than is easily recognized by sophisticated mathematical astronomers. One of Pogo's objections was to her use of some bright stars while ignoring others and the use of faint stars as connecting points. However, on a comparative basis, both of these practices are widespread. Pogo attempted some identifications and is extensively quoted by Clagett (1995, p. 164). His identifications of the Pleiades and the Hyades are certainly reasonable and are shared with several of his predecessors and successors. Gleadow (1969, pp. 191-192) attempts to identify the main stars of the Ramesside star clocks (excepting the Hippopotamus and the Giant, which take up about half the sky), although he doubts that they were originally conceived as hour markers. There is substantial similarity between his identifications and those of Renouf. Davis (1985) has argued that the Sun and the dead king cross what she translates as "the Shifting Waterway" from south to north and back. She identifies this waterway with the Milky Way and as the division between the Egyptian regions of the "northern sky" and "southern sky." 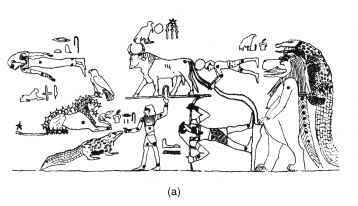 She points out that the crocodile god, Sobek, is "Lord of the Shifting Waterway" and that the crocodile asterism is a consistent member of the northern grouping of asterisms. Davis's identifications are based largely on relative positions in various depictions. Kurt Locher (1981, 1985) takes a very different approach. He attempts to correlate star patterns with the outlines of depictions (see Figure 8.5), in the manner of Biegel. EFM finds the attempt unconvincing. Figure 8.5. (a) Constellations from the tomb of Seti I. (b) Locher's (1981, 1985) correlation of star patterns with outlines of depictions. Drawings by Sharon Hanna. Table 8.5. The Coptic (Ethiopie) month names.